Explore Hale Farm & Village and take an active part in history! Each day-long experience (10am to 4 pm) includes a snack and materials; please provide a sack lunch. To register, call 330-666-3711 ext. 1720 or email halereservations@wrhs.org for more information. How does the glassblower handle molten glass? 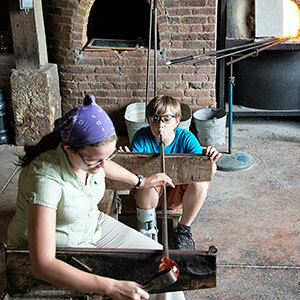 Have an up-close view of all steps of the glassblowing process; learn about traditional shapes and colors, and the history and science behind glass. Best of all, make your own handcrafted glass piece! Each InHale Camp day includes unique opportunities to meet the Hale residents of village and farm, with special access activities just for campers.